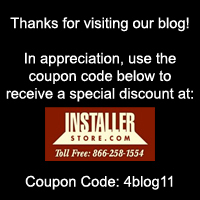 Installerstore.com Memorial Day Weekend Super Sale!! Stock up on cleaners, find your dream register, or purchase the perfect fit furniture feet and SAVE!!! Place your order online and enter the coupon code “memday7” during check-out or place your order by phone Thursday 5/26 or Friday 5/27 (closed Sat, Sun and Mon).